The National Assembly says it cannot be intimidated into abandoning its duty of providing a platform for Nigerians to agree or disagree on any proposed legislative measure. Speaker of the House of Representatives, Rep. Yakubu Dogara, said this on Tuesday in Abuja in his remarks at the resumption of plenary after the legislators’ seven-week recess. 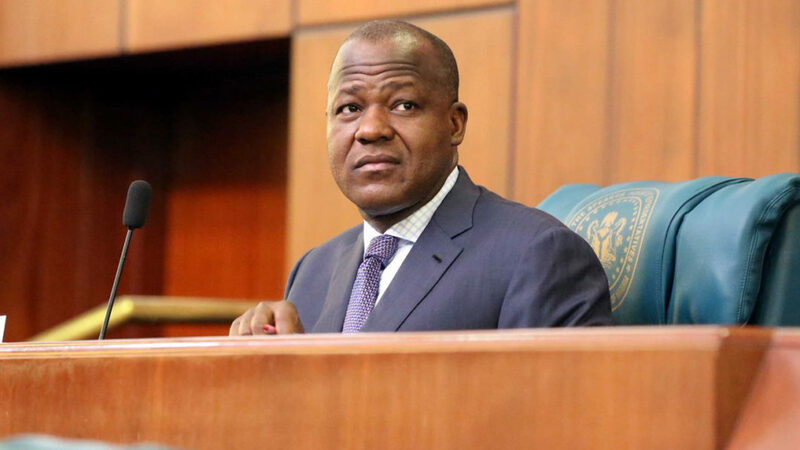 Dogara, reacting to the controversy surrounding the NGO Bill, said that transparency was what Non-Governmental Organisations (NGOs) promoted and therefore, should welcome the opportunity to interrogate the issues with open arms. According to him, everyone should understand that the principal objective of the NGO Regulation Bill is to inject transparency, accountability and prevent the subversion of national security from within and without. “No one can nor indeed, should gag the operations of NGOs in Nigeria. “But, just as they aspire for this freedom, it must be stated that freedom does not come without responsibility as there is no such thing as freedom to be irresponsible. “There are also desperate attempts to instigate religious bodies and cultural organizations to oppose the Bill by spreading the falsehood that they are the target of this bill. “For the avoidance of doubt, let me state once again that churches, mosques, esusu, market women associations as well as local quasi-financial institutions are “not NGOs’’ and thus, the bill has nothing to do with their operations. “The legislative process cannot be short-circuited,’’ he said. The speaker said that members of the Lower Chamber were also aware of the criticism over the NGO Bill which had passed second reading and was at committee stage. “Honourable members are also aware that the media have been awash with scathing criticism of the institution of the House of Representatives over the NGO Regulation Bill which has passed second reading and is at committee stage. “Public criticism of the content of the Bill is a welcome development and there are many who are doing just that. “Indeed, it is the reason why every Bill is subjected to public hearing so that the inputs of stakeholders can be obtained to ensure public buy-in. “I hasten to say that all Nigerians and other corporate persons, including non-Nigerians, are stakeholders and have a right to support or oppose a Bill. “However, when opinions are targeted at disparaging the institution of the legislature, then it becomes imperative to interrogate the motives driving such, especially when this emanates from those who should know,’’ he said. Dogara also urged Nigerians to desist from hate speech, saying it had no place in a democracy and could instigate violence. According to him, hate cannot drive out hate, only love can do that. Hate multiplies hate, violence multiplies violence. “We must learn to love one another, understand each other and respect each other for Nigeria to reach her full potential politically, socially and economically. “Of course, all healthy democracies are noisy, but they are filled with noise that elicits debate, not the noise that incites to violence. “When speech or noise leads to debate, it’s called free speech but when noise or speech incites to violence then that is hate speech. “Hate speech has no place in a democracy and must never be tolerated or allowed. “Words are powerful and once spoken, it’s difficult, if not impossible to take them back. Words have the power to create the atmosphere in which we live. “There is nothing that exists that was not created by or in consequence of spoken words. Hate speech multiplies words that have the capacity to drown the truth. “In the midst of hate speech, the truth is usually the casualty. There lies the real danger of hate speech. Yet, it is only in the truth that everything finds its worth,’’ Dogara said.